This gorgeous tray has attractive green color which is made by lacquer from Myanmar. 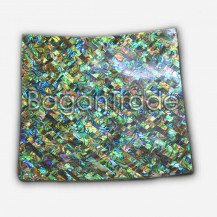 We inlaid rectangular pieces of Paua Shell on lacquer tray with qualify glue to be long lived product. The bottom color of this tray is lacquer black and upper surface color is paua shell green color. It can be used as tray for serving in Hotels, Offices and Homes. You can put candies, fresh fruits on it. The quality of our products is very nice and the price is also suitable for customers. We can negotiate the price depend on customer requirements. If you want to know more details, you can ask by chat box directly. We are warmly welcome to answer for customer inquiry. 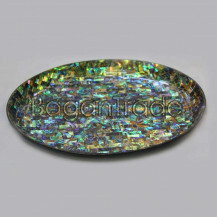 This gorgeous serving tray is made in Myanmar product which is inlaid many pieces of paua shells on Black Lacquer Tray. So the bottom color of tray is Black and the surface color is gorgeous green. The raw material of this tray is bamboo because it is being lacquer product. People who are from another countries attractive and like Myanmar Lacquer products. We created and combined with lacquer ware and sea shell products as serving tray, so customer wait nearly two months. People can use it as a serving tray or handmade craft, decoration tray in Hotels, Offices, and Homes. If you want to know more details, you can ask by chat box directly. We are warmly welcome to answer for customer inquiry. 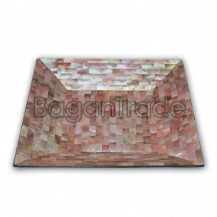 This genuine paua tray is made by lacquer and you can know about the standard level of Myanmar Craft by seeing it. Firstly we made bamboo tray after that we applied lacquer on the tray again and again, so we waited many days to become excellent lacquer tray. 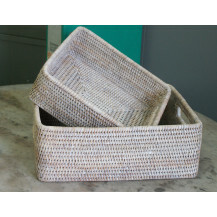 You can use it as a serving tray, decoration tray, and sea shell products in your house or office. Most of hotels used this tray not only decoration product but also as a serving tray. You gently used it in very good condition because it is qualify tray. If you interest about the details of this tray or you want to buy, you can ask and inquiry via chat box. The raw material of this plate is made by wood and made in Myanmar product. 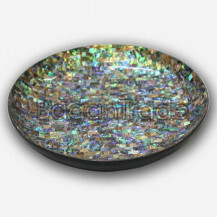 Firstly we made wooden plate and then we decorated with small pieces of oyster (Mother of Pearl) at the bottom of plate and apply the paua shell on the surface of plate. So in this plate has two color , there are green and yellow color. This lovely plate would be perfect for serving or use as a rice plate, fruits plate, candy plate. You will wait about 2 month for 12 pieces because it is made in detail with skill. This plate is expensive than the other because we decorate both inner and outer surface with sea shells. If you want to know more details, you can ask by chat box directly. We are warmly welcome to answer for customer inquiry. 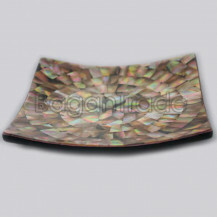 This Polished Trocus shell tray has a beautiful glossy color which is completely polished by natural color. It is great displayed on living room table with fresh fruits or candies. In most of hotel used as serving tray. 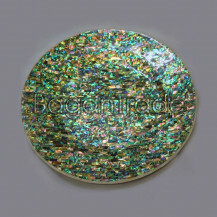 You can also use it for a seashell craft such as a decoration product. It is being lacquer tray so the back color is black and the surface color is pearl. We shaped a flower design in the center of tray and circle design with line by line. All of our products are suitable price and excellent quality. If you want to know some info concern with this product or want to buy, you can ask via chat box. We are ready to answer for your inquiry. This is wooden box inlaid with Mother of Pearl from Myanmar. Firstly we create a box with wood and then apply with natural polish to be smooth and save for using. After that we inlaid pieces of Oyster on it with qualify glue. You can open this box with easily, so it is very easy to use. We made and covered sliver around the lace of box. We have other sizes in this product, there are 3", 2" and 1.5" and the price is depending on customer requirements. 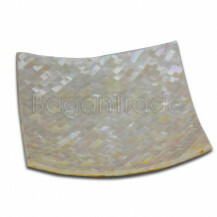 If you want to decorate for your houses, offices, or hotels with Mother of Pearl products, Please remember to our Gandamar Sea Shell Arts and Products. If you want know more details or more negotiate concern with this product, you can ask by chat box. 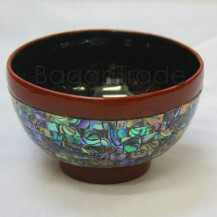 This decorative bowl is made by lacquer, so you can use as rice bowl or soup bowl and made in Myanmar. The raw material used to manufacture the objects is the bamboo. The diameter size is 4 inches ,so it is suitable for both rice and soup. Myanmar lacquer products are famous in the world. We glued and decorated small pieces of paua shell on the lacquer bowl. If you want to decorate your dining world with nature products, do not hesitate to contact us. You can ask via chat box. We are always welcome to answer for your inquiry. It is about the squared vase of glaze jade that is produced by Su Mon Jade &amp; Myanmar Craft. It is creative design of Myanmar art and made of glaze with jade and gemstone. It is unique style and modern design. It is used in home decoration and give for souvenir. It is handmade of Myanmar and colorful of gemstone and white, green and yellow. If you are interested about the product, please contact us to know more detail. The two major materials used in this product, the basic raw is wood and the second is Mother of Pearl (other name is Oyster). We made to be qualifying product for a month. The color is shining for long time because we used 100% nature products. 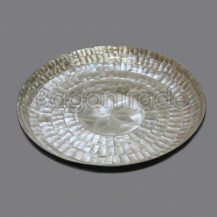 This decorative tray is hand craft product of Myanmar inlayed with white mother of pearl (Oyster) shells. Use as decor tray, serving tray, serving plate, nature tray. If you want to know more details, you can ask by chat box. This dessert plate is round shape and diameter measurement is 5.5 inches. There are two designs and two color in this product. The yellow is rectangular design and the white as like bamboo wall design. We used nature wood as raw material and decorated with mother of pearls shell with design. This gorgeous plate to display as decor plate, dessert plate on your living room table. We inlayed both of surface area with pieces of Oyster (Mother of Pearl) Shells so it is not only long live product but also useful plate. Please view pictures closely. This is a very colorful piece of art. If you want to more details or you want to change your dining world with nature products, do not hesitate to contact us. We warmly welcome to answer for customer inquiries. 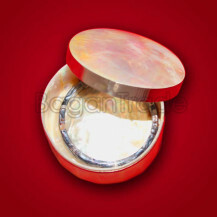 This can be used as a platter which is for serving dry snacks and accessories on your dressing table. Some restaurants used as sushi Tray. Some used as decoration thing put on table together with other accessories. The raw material is depending on bamboo because it is lacquer tray. 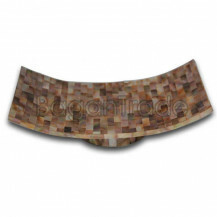 It is brown color so it is included in attractive and useful tray. The bottom color is lacquer black. The length is 9 inches and the width is also 9 inches, so it is suitable size for use. If you want to know details about this product or want to buy, you can ask via chat box directly. We are welcome to answer for customer inquiries. 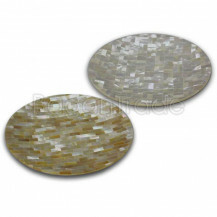 It is made of mother of pearl dessert plate and wood. It is created star design of center. It is similar as trocus and smooth surface. It is handcraft and made in Myanmar. It is easy washing, hard to break and non toxic, durable use. It is safety and health, environmental protection; food grade can pass all food safety. It is not suitable for microwave. 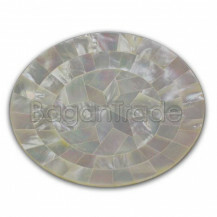 It is designed more beauty with mother of pearl on both of sides. It can be make for cake, sandwiches, snacks, fruit plate and desserts, etc. It is natural color of mother of pearl. According to clientâ€™s requirements, we can customize designs and sizes. Any other need of help, we will try to do for you in chat box. 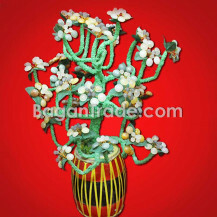 It is Myanmar Instrument Design Under Glazed Flower Pot that is the fine glaze of Myanmar instrument design glaze vase. It is made of colorful jade and gemstone. It can be use as home, hotel, villa decoration and gift. It is good quality and durable handmade only of Myanmar. 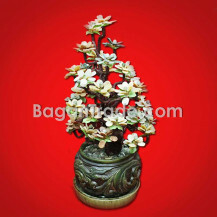 If you want to order this flower pot, please contact us to know more detail.